Xonotic 0.8.1 is out! Aw yer! - Navigate to your Xonotic installation folder. - Navigate to the misc/tools/rsync-updater folder. - Execute the update-to-release.sh (for Linux or Mac) or update-to-release.bat (for Windows) and wait for it to complete. Read full info about new features at the blog post! We hope you all enjoy it. See you out on the servers soon. As always - happy fragging! It looks awesome! I'll play it as soon as the Arch Linux package is updated (based on 0.8, Saturday)! Yay! really, the 0.0.1 version change has bigger changes then some 0.1 version number changes. EDIT: Nice update to the scroll and the UI looks much better, it's all about the details! Wasnt there the intention not to add old stuff from nexuiz? Why does final rage has such a low level of detail? As for your map - if you'd like us to consider adding it, I do believe we need to have the sources. There's also apparently licensing concerns. Last but not least, we'd want the author to actually want it to be included. Looking forward to playing around with this, version 0.8.0 was giving me issues. For those wondering: The getdeb package doesn't support the update process listed in the first post. I've prodded them to update the package to 0.8.1. Hype!!! Nice to see Warfare in this release! Thank you very much! But I wonder how the map managed to get a fixed skybox + lighting? The autobuild server always failed at this when I tried. Are there any fixes I missed? To the dev team and contributors: Excellent release, thank you. Somehow the performance with xonotic-sdl increased significantly on Linux w/ Intel drivers, that's great! (08-27-2015, 03:52 PM)Antibody Wrote: As for your map - if you'd like us to consider adding it, I do believe we need to have the sources. There's also apparently licensing concerns. Last but not least, we'd want the author to actually want it to be included. mapsource is included in version 4. the models are mainly from the game the game the authers of the models which are not from the game are from monad and qbit, so licensing shouldnt be a big problem. Any chance you could make the simple item sprites ignore the command? edit: How's the item timers? Do you see timers for any items picked or just the ones you picked? Also are they votable and possible to turn off in tournaments, or pickup servers? The itemtimer shows Megas and powerups. In the future also 50s (already in hit). Currently it just displays only one item of there are two same items on the map (50 armors on Fuse for example). It is shown in warmup and for spectators (as the player wishes) but not to players in the match. All in all pretty much like shown in QL streams and not like Reflex. I can't get the new simple items, I get the old ones when I enable them through UI and cl_simpleitems. (08-29-2015, 09:56 AM)machine! Wrote: I can't get the new simple items, I get the old ones when I enable them through UI and cl_simpleitems. The change should take effect after the next mapload or restart. 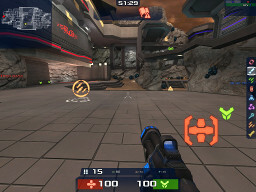 FYI: The Getdeb packages for Xonotic appear to have been built for 0.8.1.